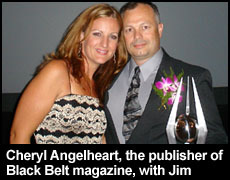 Thanks to you Black Belt readers I was inducted into the Black Belt Hall of Fame as Self-Defense Instructor of the Year 2006 on July 28, 2006. The award is proof that this monthly column, HIGH RISK, and the reality-based concepts that I have introduced through it since the first day of 1999, is gaining worldwide acceptance and steadily changing the way people are learning and teaching self-defense. When I was in Holland back in the beginning of July teaching my Reality-Based Personal Protection Level 1 seminar, Bob Young, the editor of Black Belt magazine, left me a message on my voice mail saying that he needed to talk to me. I was caught up on all of my HIGH RISK column articles that I submit monthly, so I thought that maybe something was wrong or that I had made a mistake on my latest submission. I immediately called him back and was shocked at the news he told me. 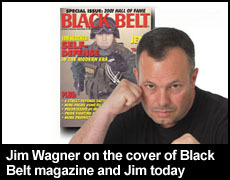 Bob said, “Jim, there was an overwhelming response from our readers, and as such you have been voted as this year’s Black Belt Hall of Fame Self-Defense Instructor of the Year. Congratulations.” As soon as I found out about the award I contacted many of my top instructors. Of course, for those who teach this system this is a victory for them as well. As soon as my director of Sweden, Peter Falk, heard the news he wanted to put it on his own website immediately. Fernando Figueroa from New York said to me, “It’s about time. I’ve been voting for you every year for the last three years.” Dallas Johnson, my director of Canada, sent me an email stating, “Well deserved.” Dave Shorter, my former director of England and still a close friend, telephoned me and said, “It’s about time you get the recognition you deserve.” I also heard from Christophe Besse, my Reality-Based director of France, Elizabeth Greenman, my top female instructor in the United States, Rich Dawson now stationed in Guam with the U.S. Coast Guard, Adrian “Sam” Markey my director of Ireland, and many others. When I first went to Bob Young in 1998 I told him that if given the chance to write for Black Belt magazine I would “change the martial arts world.” Before I wrote you didn’t see any articles about air guns, criminal attacks, terrorism, the O.O.D.A. process, and all kinds of Reality-Based concepts. Now just pick up a Black Belt magazine today and you will see the impact that my articles and my system has had on the martial arts world. In just three short years my ideas and techniques have grown globally faster than any other system before it. 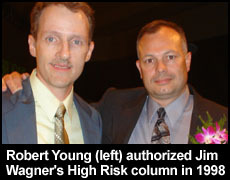 Being inducted into the Black Belt Hall of Fame is proof of my promise to Bob Young only four short years ago. During the impressive award ceremony and dinner I attended in Long Beach, California I had the opportunity to talk to Black Belt Hall of Fame Man of the Year 2006 Ted Wong, one of the original students of Bruce Lee. 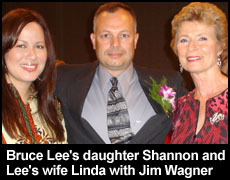 Minutes later I had a good conversation with Bruce Lee’s daughter, Shannon Lee Keasler, and his wife, Linda Lee Cadwell. All three congratulated me on my award and said that they were very impressed with my background. To my surprise Linda said to me, “You’re the real thing.” Yet, it was I who was honored to meet them. I was proud to tell them that my Reality-Based Personal Protection system came about because of Bruce Lee and the system that he created - Jeet Kune Do. I was doubly pleased to meet Shannon because she was on the front cover of Black Belt magazine that featured my first HIGH RISK article on the January 1999 issue. Back in 1977, at the impressionable age of 16, I was one of the original Jeet Kune Do students studying under Dan Inosanto and Richard Bustillo, also both original students of Bruce Lee, at the Filipino Kali Academy in Torrance, California. For several years these men fed me a constant diet of Bruce Lee’s fighting philosophy, “If it works keep it, if it doesn’t throw it out.” They, and other Jeet Kune Do greats, such as Larry Hartsell and the late Ted Lucay Lucay, also taught me to keep studying other martial arts to find “the truth of combat.” These instructors were never threatened by their students going out an experimenting, so that is exactly what I did. This was long before the term “mix martial arts” came into vogue. In addition to Jeet Kune Do, Filipino Kali and Wing Chun I also studied Thai kickboxing, French Savate, Vietnamese Kung-fu, Aikido, European fencing, Kenpo, Tai Chi Chuan, Ju-Jitsu, Western boxing, and in recently years I’ve picked up Russian Systema, and the Israeli systems of Krav Maga, KAPAP, Hisardut, and Lotar (a system for Israeli counterterrorists). I credit Bruce Lee’s Jeet Kune Do for pointing me in the right direction. However, Bruce Lee was a civilian and his training was limited to that realm. It was my military, corrections, and law enforcement career that opened my eyes to criminal and terrorist attack methods which were never really addressed in Jeet Kune Do or in my former traditional and sport-based systems. Yet, I took the basic Jeet Kune Do philosophy I had learned and applied that litmus test to modern techniques and training methods. Had Bruce Lee lived to see the birth of the reality-based movement I am sure he would have agreed that it was the next essential evolutionary period of the martial arts. After all, in incorporates firearms training, criminal knife attacks, terrorism survival methods, and a whole lot of other things that are essential in this day and age. His daughter, wife, and top student seem to think so as well. When I finished talking to Ted, Linda, and Shannon I told them I was grateful to the same man that changed all of our lives and I promised them that would fully endorse and support the Bruce Lee Foundation. The foundation is a public benefit corporation seeking to preserve, perpetuate, and disseminate Bruce Lee’s life example, philosophies, and the art of Jun Fan Jeet Kune Do through inspirational events, educational programs, martial arts instruction and the Bruce Lee museum. They are headquartered in Los Angeles, California and will accept any size donation or voluntary help. If your life has been touched by Bruce Lee, like mine has, or you are just a loyal fan, please help this worthwhile foundation. 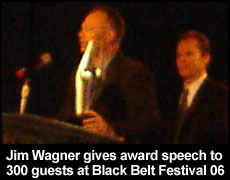 Finally, receiving my award at the Black Belt Festival 2006 at Long Beach means a lot to me because it was the readers of Black Belt magazine that nominated me. With a circulation of over 70,000 and a worldwide reach of much more than that, it is truly the highest martial arts award on the planet. For all of you who voted for me I want to personally thank you. However, this award is more than me getting a trophy to place in my office on a shelf. It represents your endorsement for the Reality-Based Personal Protection system that I started on January 21, 2003. This award is a sign that the reality-based movement has taken its place on the world stage, and that people finally have a complete system that includes Pre-Conflict, Conflict, and Post-Conflict training. It means that people are becoming more aware of modern crime and terrorism, and have looked into this system as a means to learn how to protect oneself. What does Black Belt have to say? 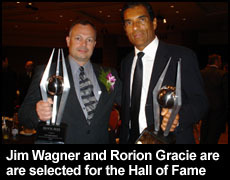 Click on these pdf files to see what Robert Young, the chief editor of Black Belt magazine, had to say about my induction into the Hall of Fame found in the December 2006 issue.